The creation of new markets for semiconductors could help iron out demand fluctuations. The chip industry has changed significantly since the last big downturn. And while there is no indication a downturn is on the horizon, analysts are beginning to ask questions about what comes next. Inventory is building at systems companies because of weaknesses in some of the key markets such as mobile phones and tablet computers, and there is a growing risk of trade wars due to recently imposed tariffs, as well as money supply tightening in China as a means of reining in corporate debt. At the start of the last major downturn in 2008, there were two big markets for chips. 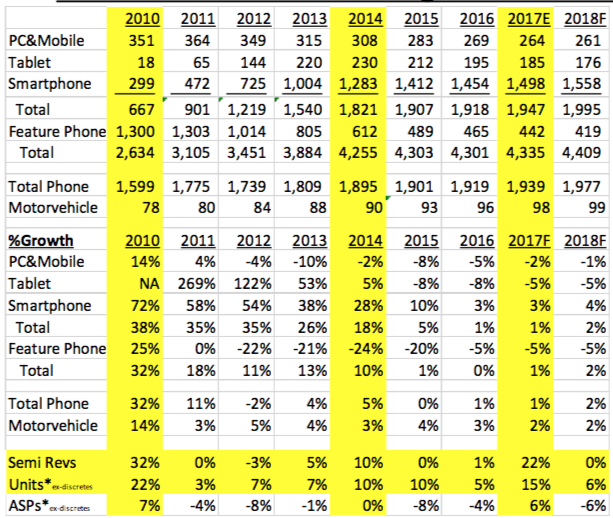 One was mobile phones, which managed to do quite well with the shift to smartphones. That was reflected in the earnings of Arm and Qualcomm. The other was computer chips, which was reflected in the earnings of Intel. Comparing these three companies, it’s not hard to see where these various sectors began recovering and spiking. Fig. 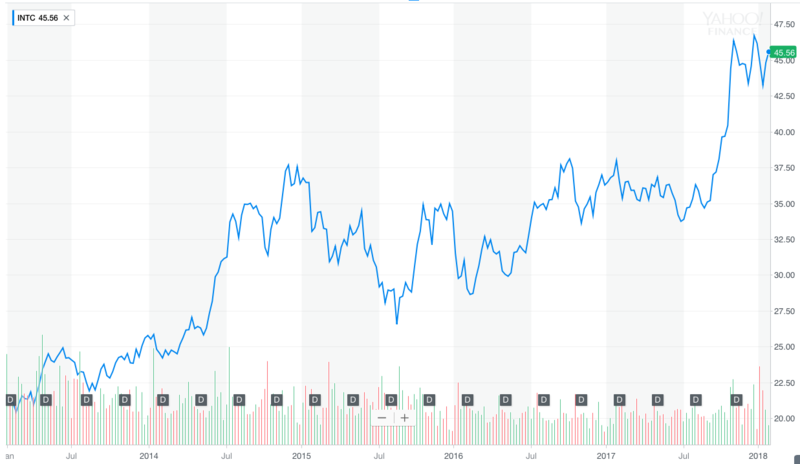 3: Qualcomm stock price recovers in 2014, and again in 2017. All of these match up well with the revenue chart for end market unit growth from AlphaOne Capital Partners, which founding partner Dan Niles showed at the SEMI Industry Strategy Symposium last week. While some of the chip design was taken in-house by companies such as Apple and Samsung, the overall sales trend is consistent with fluctuations in smart phones and computers. This is only part of the picture, though. Over the past couple of years, a variety of new markets have sprung up alongside mobile and computers. Automotive chip design is booming as automakers scramble to add assisted and autonomous driving features, including arrays of image sensors for cameras, LiDAR and radar, well as pressure sensors, accelerometers, and sophisticated AI systems that can process at least some of the data being streamed into cars. Alongside automotive chips, industrial IoT is exploding, according to numerous industry sources. The problem here is that exact numbers of chips being sold into these operations is difficult to quantify because the applications are so diverse. In addition, there is a surge in cloud-based services, machine learning and AI, all of which demand the most advanced processors, including custom or customizable processors. All of these markets bode well for semiconductor design at the bleeding edge, which is where the highest average selling prices are, the biggest budgets for design tools, and the greatest need for advanced tooling, methodologies and expertise, as well as for older-node semiconductors for industrial markets, where there is a strong emphasis on custom design, much more intensive simulation, degradation/aging modeling and inspection, which are necessary for chips that are expected to function for 15 to 20 years rather than 2 or 3 years. Add to that growth in various IoT sectors, and there are enough new markets to begin taking the strain off whether mobile phone sales are up or down for a quarter or whether consumers see enough reason to upgrade their computers. Chips are pouring into markets where they have never had much of a presence, and many of those segments is somewhat independent of the others. A global downturn will still take a toll, of course. But it’s also likely that many of these markets will be on different business cycles. So if one doesn’t recover quickly, another may help smooth over a down period. And with more heterogeneity in designs-multiple processors and accelerators and various memory types-that could further iron out some of the jaggedness in economic cycles that have made semiconductors a feast-or-famine type of industry. The bottom line is the chip industry may prove to be much more consistent over the next decade than at any time in its past. And while that may make it less exciting for stock watchers, that’s not necessarily bad. Right now it’s the lull before glasses, car as a service with autonomous electric vehicles, robots, IoT (this one needs to stop obsessing about data). There was no interesting device at CES, nothing of great value or fun. Lots of toys for people with too much money and no real problems but nothing substantial. That’s alarming and what’s missing is product design. The world can’t even come up with a half decent smartwatch and it’s not even trying anymore. Anyway, glasses will also have a huge negative impact on revenue. They can replace phones, tablets, PCs, TVs, projectors, smartwatches, binoculars, hearing aids, night vision goggles, headphones, cameras, in car displays, smart assistant centric devices (like smartspeakers) and displace to some degree set top boxes, gaming consoles and more.